Jeremy Wade’s solo, Fountain, made its Seattle debut at Velocity’s Founder’s Theater February 15–16, 2013 to an attentive group of dancegoers. 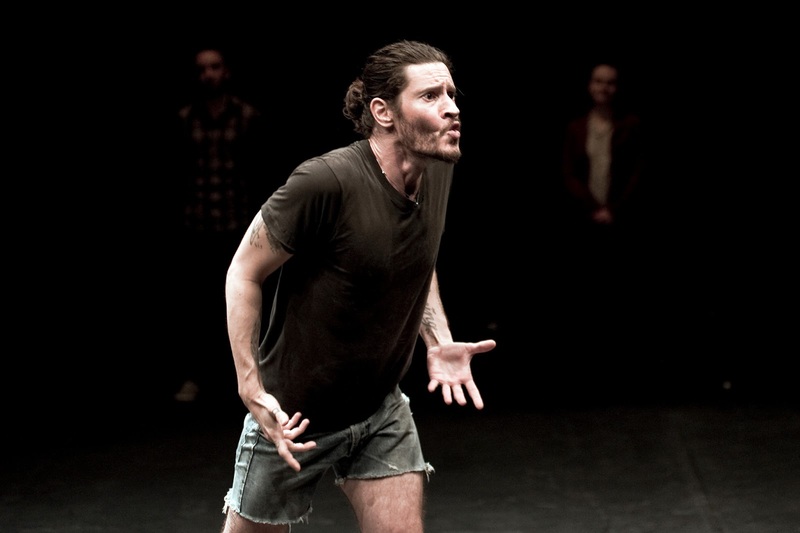 In Fountain, Wade, an award-winning American dance artist based in Berlin, explores the extremes of his voice and body while also facilitating a group experience for the audience. The result is an arresting solo work that gently demands a high degree of audience participation as a way of creating a shared, empathetic environment, which supports a solo dance that ranges from distressing to flowing. One of Fountain’s most striking features was how seamlessly Wade integrated the audience as active participants in performance. 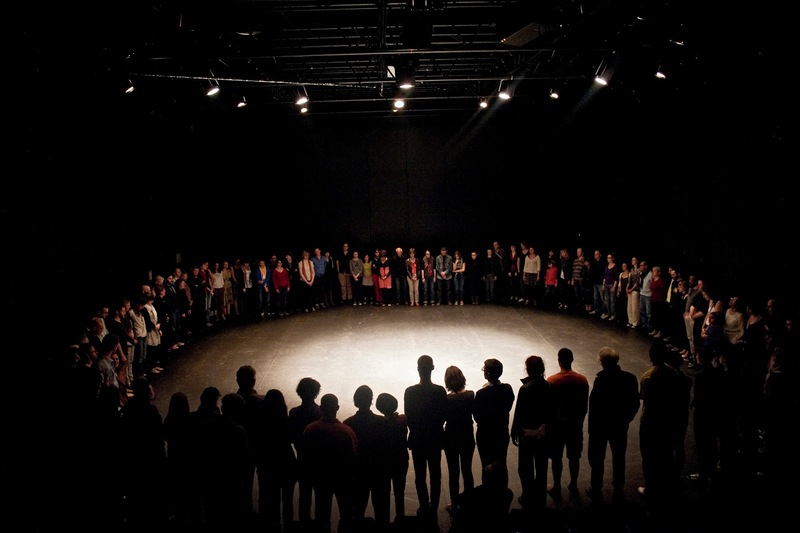 Some participatory performance pieces establish a barrier between performer and audience and then break it, making the choice to participate, or not, feel very conspicuous. Wade, on the other hand, structured the participation as a true collective experience. His persona was one of a compassionate group leader, rather than an artist stretching the limits of his audience’s comfort zone. Wade, clad in nondescript faded black tee and cut-off jeans, entered the room full of standing people (no seating was provided) almost unnoticed. Using his words and his example, he lead the group through activities that included simple walking, an eyes-closed visualization of the infinite space above and below the body, and a resonating group humming session in a tight but malleable clump. Finally, the clump unwound into a large circle that delineated the boundaries of the true “solo” portion of the evening. Without ceremony, Wade took his place inside the circle and began a ritual of breathing. His dance focused every cell in his body on the act of sucking in air and deeply exhaling. His breathing gave way to vocalizations ranging from dragon-breath to sputtering balloon to donkeyish bray. The evolution of his voice found its conclusion in his desperate cries of a very human syllable: “mine!” His movement tread a fine line between clownish exaggeration and an uncomfortable loss of control, as though the synapses in his brain were firing out of order. It was both uncomfortable to watch and impossible to look away; sometimes it was uncertain whether laughter or a gesture of aid would be the appropriately empathetic human response. The repetition of sound and movement diminished his humanness after a time, and increased the dance’s ritualistic, almost possession-like qualities. It was the utterance of “mine” that brought him back to his human self. Quietly, exhausted and transformed by his private experience, he asked the group to sit. 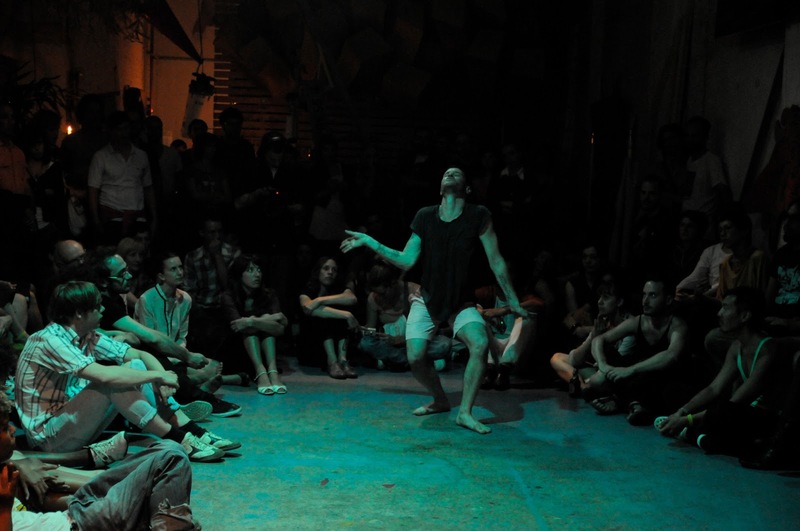 In the final and most purely dance-based chapter of the evening, Wade relinquished the strong presence of his own voice in exchange for a sound score by Berlin-based Dutch composer Tian Rotteveel. The sound filled the space with rushing noises, which gradually built in volume and incorporated simple synthesized tones. The aural qualities and structure of the sound score followed the same pattern of Wade’s vocalizations, but these recorded sounds felt singularly artificial in comparison with Wade’s very living voice. The new sound was welcome, a relief to the ear after Wade’s raw sounds. Wade is a captivating mover. In this last section, he tore through the space of the circle, across and around, sometimes a breath away from his audience. His movement possessed the sharp, harsh qualities of contorted spines and uncertain balances while at the same time managing to be utterly soft and effortless. No matter how many times he cascaded to the floor, he never made a jarring sound—an unexpected, even surprising contrast to the visceral harshness of his earlier sounds and body postures. He danced, but he appeared less as a dancing body than as a conduit for space and air, as though he was gathering all the energy in the room and beyond and letting it course through his body as the audience sat watching, riveted. There were a few audience members who chose to observe Fountainfrom the outside, and not one of them stayed until the end. Nontraditional performance settings will never be to everyone’s taste. Some who enjoyed the group experience portion may have felt alienated by the abrupt transition in focus from the whole group to solely on Wade. However, everyone in attendance bore witness to a powerful physical performance from an artist who knows how to stretch the bounds of his own physical experience and surrender it as a gift to all who watch.